Cutting boards are essential to everyday kitchen meal prep, and this one is sure to bring style and function to your space. This board's design is lovingly lettered and wood burned by hand. It's the perfect size for cutting and preparing small fruits and vegetables. It looks at home leaning against a backsplash, hanging by it's handle on a hook, or sitting alone on any countertop. This board is meant to be used and loved for many years to come. Made of beech wood and measures 11 3/4” x 6” with handle. Wooden cutting boards need to be kept moist so that they don't dry out and crack over time. 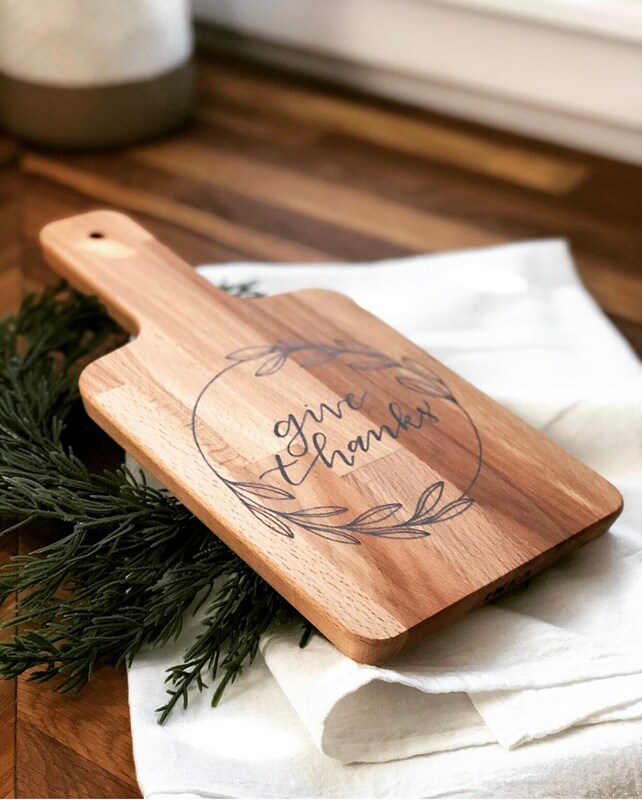 If you use your cutting board often, take mineral or coconut oil (any food grade oil will work fine) on a dry cloth and rub over the entire board. Set on a dish drying rack until the oil is completely soaked into the wood. Hand wash only with dish soap and dry immediately after with a towel. Allowing your board to air dry will dry it out and eventually cause it to crack over time. As with any wood kitchenware or utensil, discolorations are common when cutting certain foods on it.